Transparency Market Research (TMR) has published a new report titled, “Pharmacy Repackaging Systems Market - Global Industry Analysis, Size, Share, Growth, Trends, and Forecast, 2018–2026”. According to the report, the global Pharmacy Repackaging systems market was valued at US $ 1146.8 Mn in 2017. It is projected to expand at a CAGR of 7.8% from 2018 to 2026. Factors such as increasing number of medication errors that fuel the need to improve patient safety and rising focus on reducing cost and wastage of inventory are driving the global market. 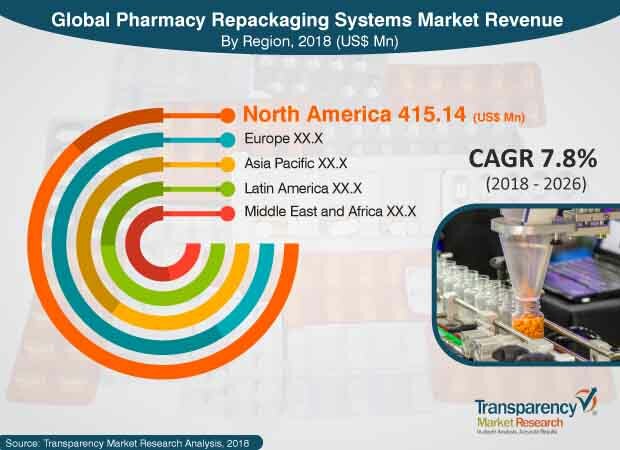 North America is projected to dominate the global pharmacy repackaging systems market, owing to stringent healthcare regulations to improve patient safety in the region. Asia Pacific and Latin America are highly lucrative markets. The pharmacy repackaging systems market in Asia Pacific is projected to expand at a CAGR of 8.3% during the forecast period. Rapid expansion of healthcare industry in major countries and aging population are key factors that drive the pharmacy repackaging systems market in the region. Increasing incidence of medication error-related deaths and government regulations are putting pressure on health care institutes and pharmacists to deploy advanced technologies to reduce medication errors. Medication errors affect one in 10 patients, globally, and lead to death or mental illness. Medication errors increase the medical cost for both health care providers and pharmacists. According to a survey conducted by the Society of Actuaries, measurable medication errors cost US$ 20 Bn to the U.S economy, while majority of these errors are easily avoidable. Hence, the U.S. Government is taking considerable initiatives to reduce these medication errors. According to the U.S. FDA, on average, one person dies daily as a result of pharmacy mistakes. Increasing pressure for patient safety requirements and government regulations are expected to prompt health care providers to deploy advanced technologies to avoid medication errors in the near future. This is likely to boost the U.S. pharmacy repackaging systems market. Hospitals and pharmacists are facing significant challenges when it comes to maintaining an inventory. Traditional and manual methods used in hospitals and pharmacies make it difficult to track their inventory. Automated packaging systems, such as automatic tablet packager, automated vial filling pump, and compliance packaging systems along with automated dispensing systems, provide pharmacists and health care providers real-time access to their stock, which in turn, helps them to maintain adequate level of inventory. The global pharmacy repackaging systems market is expected to expand at a considerable pace in the near future due to several factors including technological advancements, such as barcoding, and the rising need for healthcare providers and pharmacists to get more time for patient care. In terms of product type, the pharmacy repackaging systems market has been classified into blister card/compliance packaging systems, pouch packaging automation systems, bottle filling/ pill counting automation systems, liquid medication packaging systems, and others. Automated blister card/compliance packaging systems was the dominant segment and was valued at US $ 145.7 Mn in 2017. The segment is expected to expand at a CAGR of 7.8% during the forecast period, owing to increasing awareness about benefits and advancements in technologies, which have prompted small and mid-sized hospitals to invest in affordable small-sized automated unit dose packaging systems. Single-dose blister packaging is the most dominant sub segment, as it helps reduce dose wastage and increase compliance. Furthermore, medicines are pre-measured into precise doses to reduce the risk of a dose being measured incorrectly. Moreover, the patient is charged for only the medication that is actually required, thereby reducing the cost, as the patient is not charged for an entire bulk bottle. Pouch packaging automation systems offer multi-dose adherence/compliance packaging in which the tablets are packaged into easy to tear, clear pouches marked with patient information containing drug name, dosage, date, time, explanations, and clear instructions on mode of drug administration. In terms of end-user, the global pharmacy repackaging systems market has been segregated into retail/community pharmacy, hospital pharmacy, long-term care (LTC) pharmacies and mail order pharmacies. The retail/community pharmacy segment is expected to maintain its dominant position in the market, and account for 52.0% share, in terms of revenue, by the end of 2026. The segment was valued at US$ 591.9 in 2017. It is projected to expand at a CAGR of 7.9% during the forecast period, owing to better inventory management and reduced cost per employee through automated repackaging. Mail order pharmacies are a major end-user of repackaging systems in North America. The segment is expected to expand at a significant growth rate during the forecast period. In terms of region, the global pharmacy repackaging systems market has been divided into five major regions: North America, Europe, Asia Pacific, Latin America and Middle East & Africa. North America dominated the global market in 2017. The pharmacy repackaging systems market in the North America is driven by high investments made in cutting-edge drug research, resulting in new sophisticated treatments with specific packaging requirements. Major demand for pharmacy repackaging systems was from large chain pharmacies and hospitals. Demand for pharmacy repackaging systems from long-term care centers and mail order pharmacies remained at a low level of automation, restricted to storage cabinets, inventory controlling dispensers, and pill counters. The market in Asia Pacific is anticipated to expand at a notable CAGR during the forecast period, due to the rapid expansion of the health care industry in major countries such as China, Japan, and Australia. Japan is a highly mature market in the region due to considerable automation. Asia Pacific is a price sensitive market and pharmacists invest only in light, affordable, and durable automated devices such as counting pill machines and tablet printing machines. The global pharmacy repackaging systems market is semi-consolidated in terms of number of players. Some companies operating in this market include Omnicell, Inc., Talyst, Inc., Becton Dickinson & Company, Kirby Lester (Capsa Solutions LLC), Swisslog Holding Ltd., Yuyama Co., Ltd., TCGRx, Euclid Medical Products, ARxIUM, and Takazono Corporation.